I’m not sure if you’re aware of this or not, but the food photos (all photos actually) look better on the web when saved in the SRGB color space. This is all a bit technical for me to explain, and you need to go somewhere else to really understand it better, but believe me when I say that you want to convert your photos into the SRGB color space, if they aren’t already in it. As I understand it, printers prefer to have photos in RGB and web browsers reproduce files saved in SRGB better than RGB sived files. 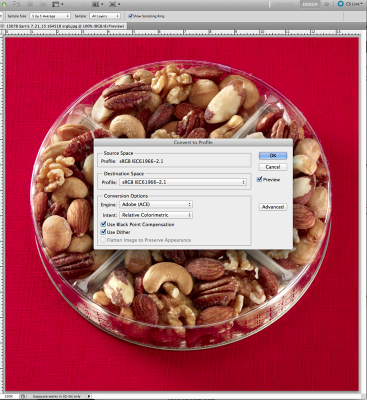 Since I shoot mostly for printers, I keep my Photoshop preferences set to save my files in RGB and when I know I’m going to use one of my food photos for my web page, I have to convert it before I save it as a jpg. Go to the Photoshop menu, under Edit and find “convert color space” and play from there. Even the icons of your files will appear different. 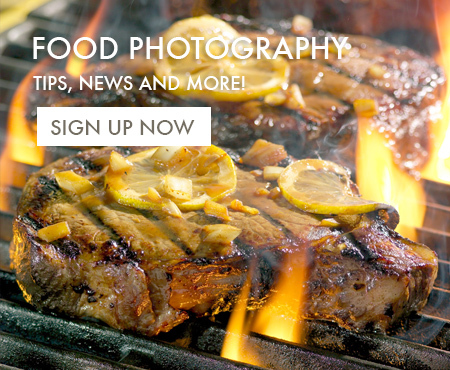 I’m telling you this because it does make a big difference and if you want your food photos to look as good as possible, you need to save your photos in the color space that best suits the photo’s use. So, if your food pics aren’t looking as good online as you think they should, and you can’t quite figure out what you’re doing wrong, check the color space.